Helper Fairy Wren scrutinising an invading cuckoo. (Phys.org) —New research has solved a mystery as to why some birds choose not to reproduce, and instead help to guard the nests of their close relatives. This occurs in about nine percent of all bird species. The University of Melbourne collaborated in a study led by ANU and Cambridge University. The findings showed non-breeders helped drive off birds like cuckoos, which lay their eggs in the nests of other birds. "Birds like Cuckoos are called brood parasites, which means they are reproductive cheats. They lay their eggs in the nests of other birds, imposing the costs of rearing on their hosts, who often lose their entire brood of chicks as a result," said Dr Naomi Langmore the lead investigator at ANU. "Biologists have long wondered how this strategy, termed cooperative breeding, could be evolutionarily successful," she said. Dr Michelle Hall and Associate Professor Raoul Mulder, coauthors on the study from the Department of Zoology, University of Melbourne, said "When it comes to guarding the nest, if there is extra help for the breeding pair, it enhances protection against brood parasites, and the chances that their own chicks will survive." 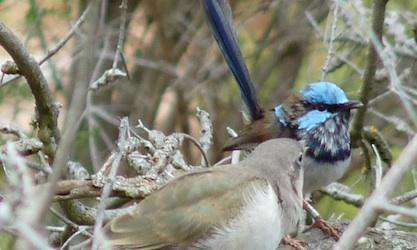 The team from the University of Melbourne contributed to the study with data from over 100 families of superb fairy wrens living at Serendip Sanctuary, near Melbourne and Campbell Park, near Canberra. Our data helped show that nests of larger family groups were less likely to contain cuckoo eggs than nests of small family groups. Experiments with model cuckoos conducted at Serendip Sanctuary showed that bigger host groups of birds aggressively mob the invading cuckoos at their nests much more than smaller groups. "Understanding this interaction between cooperative breeding and brood parasites also helped explain the uneven global distribution of cooperative breeding birds," said Dr Hall. The global distribution of cooperative breeders and brood parasites is tightly linked and concentrated in two major geographic hotspots: Australasia and sub-Saharan Africa. More information: "Brood Parasitism and the Evolution of Cooperative Breeding in Birds," by	W.E. Feeney et al. Science, 2013.